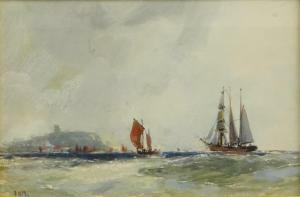 Find artworks, auction results, sale prices and pictures of Frank Henry Mason at auctions worldwide. 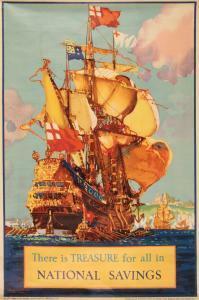 FRANK HENRY MASON (1875 - 1965): A NATIONAL SAVINGS ADVERTSING POSTER, no.212, Publ. The National Savings Commitee, printed by Howard, Jones, Roberts & Leete, London, 76cm x 50.5 cm Condition Report: Item appears to be in good overall condition, some creases and minor discolouration, no visible tears. 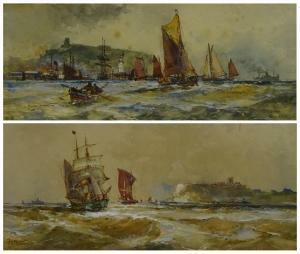 174 FRANK H. MASON (1876-1965) YORKSHIRE COAST BY LNER / PAUL JONES' FIGHT OFF SCARBOROUGH. 1932. 39 3/4x27 3/4 inches, 101x70 1/2 cm. The David Allen Printing Co., Ltd., London. Condition B+: repaired tears, creases, restoration and minor overpainting in margins and image and along vertical and horizontal folds. 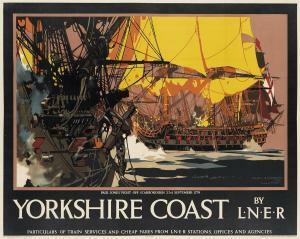 Mason was primarily an artist of marine subjects and he designed numerous posters for different British railway companies.